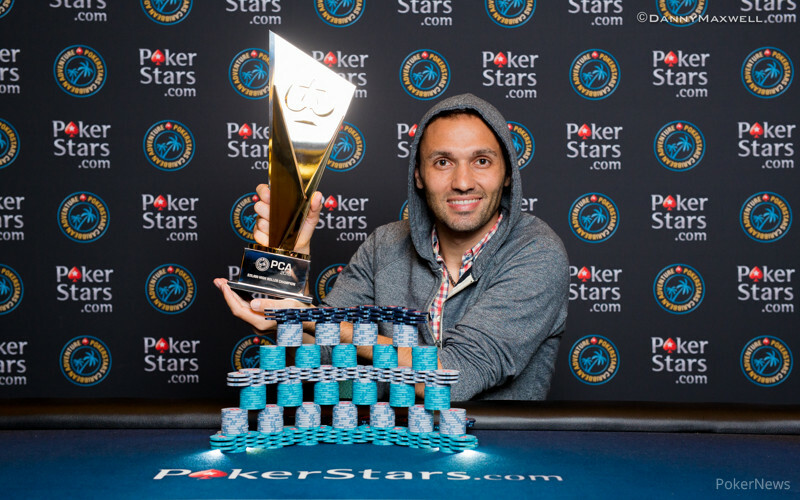 The 2016 PokerStars Caribbean Adventure $25,000 High Roller began with 225 entrants (173 unique players + 52 re-entries) who created a $5.4 million prize pool, and after three days of intense play, it was Nick "FU_15" Maimone who eliminated every player at the final table to walk away the winner for $996,480. Known primarily for his online exploits, Maimone, who hails from North Carolina but now resides in Honduras, managed to eclipse his live lifetime earnings, which previously stood at $881,218. 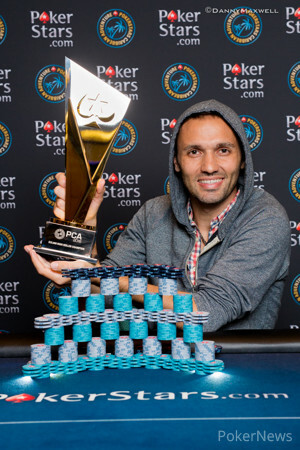 The win was a big cherry on top of a successful 2016 PCA that saw him finish 87th in the LAPT Bahamas Main Event for $4,120 and fifth in Event #42: $5,300 No-Limit Hold'em 8-Handed Turbo Bounty for $10,580. That money will certainly come in handy as Maimone and his wife are expecting their first child in May. 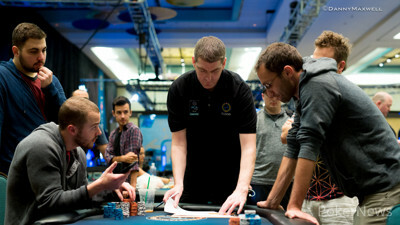 The day began with nine players returning to action, and it took nearly two hours for the first elimination to occur. That is when a huge three-way all-in pot developed between Maimone, Dario Sammartino and Anton Astapau. All three players held pairs – nine through jacks in fact – with Maimone out in front. The fishhooks held and Maimone more than doubled into the chip lead while sending Astapau to the rail in ninth place $116,640. From there, Ben Heath was bounced in eighth when his pocket sevens failed to hold against the ace-eight of Maimone, and Chance Kornuth followed him out the door, the low man on the totem pole in a three-way all-in hand. From there, Maimone eliminated both Andrey Zaichenko and Brian Yoon in sixth and fifth place respectively. The former ran his weak ace into Maimone's ace-jack, while the latter lost a standard coin flip. In the first hand back from the dinner break, Winter raised to 180,000 under the gun and Maimone called from the button. 2015 World Series of Poker Main Event runner-up Josh Beckley, who began the day as chip leader but fell to the short stack, came along from the small blind, Sammartino folded the big, and three players took a flop of , which they all checked. When the hit the turn, two checks inspired Maimone to bet 300,000, Beckley called, and Winter got out of the way. The river put four spades on board, and Beckley checked to Maimone, who bet 525,000. Beckley then check-raised all in for 1.225 million. "This is a tough one," Maimone said sarcastically before putting in the chips. Beckley confidently tabled the for an ace-high flush, but it was no good as Maimone held a straight flush with the . Beckley, who earned his seat via $2,700 satellite, was shocked, shook his head, and made his way to the payout desk to collect $439,560 for his fourth-place finish. Maimone then eliminated Sammartino in third place – the result of the Italian's failing to get there against Maimone's – and took a slight chip lead into heads-up play against Winter. That is when the two opted to strike a deal that saw Maimone lock up $966,480, Winter $914,580, and $30,000 plus the trophy left on the table. Maimone quickly pulled out to a healthy lead, and in what would be the last hand of the tournament raised to 250,000 from the button and then snap-called when Winter three-bet all in. Winter had a major kicker issue, and it failed to resolve itself as the board ran out a clean . By finishing as runner-up, Winter surpassed his previous best score of $562,772, which came last summer when he emerged victorious in the $10k Bellagio Cup. What's more, Winter admitted he had numerous side bets tied to the result and he is primed to head back to Florida with quite a bit more than what's reported. Congratulations to Nick Maimone, winner of the 2016 PCA $25,000 High Roller! In the last hand of the tournament, Nick Maimone raised to 250,000 from the button and then snap-called when Sean Winter three-bet all in. Sean Winter raised from the button to 200,000 and Nick Maimone called. The flop came down and Maimone check-caled 155,000. On the turn the hit and Maimone check-called another 425,000. Maimone showed and he took down another big pot. With 420,000 in the pot and a flop of , both players checked and the dealer burned and turned the . Nick Maimone bet 500,000 and Winter called. Maimone tabled the for tripes and it was good as Winter mucked. Not long after, Winter raised to 200,000 from the button and then called when Maimone three-bet to 700,000. Maimone then fired out 600,000 on the flop and Winter folded. 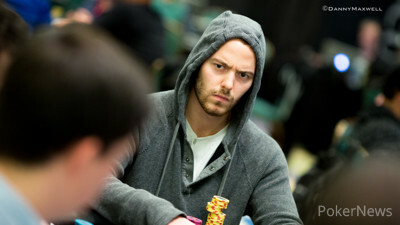 Play is fast and furious, but the pots haven't been that big in the beginning stages of this heads-up match. Just now Nick Maimone raised from the button to 225,000 and Sean Winter called. The flop was and Winter check-called 350,000. On the turn both players checked, and Winter check-folded to a bet of about 700,000 on the river. Since a deal has been struck, both players have agreed to cut the length of each level in half from one hour to 30 minutes. Additionally, they're playing hands quick in terms of how fast they act. No significant pots yet, but they are flying through them in an attempt to crown a winner. After extensive negotiations the final two players have agreed to a chop. Nick Maimone has locked up $966,480, Sean Winter $914,580, and $30,000 plus the trophy will be left on the table to play for. The players still haven't returned from what was supposed to be a short break. A deal is being discussed, but no progress has been made. We will keep you posted on whether or not a deal is reached, and when play resumes.